Soil washes from the roadway into the cluvert on Twp. Rd. 165. Photo by AimeeKanagy. The residents of this home on Twp. Rd. 165 had to be evacuated. Photo by AimeeKanagy. Twp. Rd. 21 near Ashley was flooded. Photo by AimeeKanagy. The power substation at Twp. Rd. 165 and Twp. Rd. 21 was flooded. Photo by AimeeKanagy. This was what County Rd. 184 just ahead of County Rd. 25 looked like. Photo by Bri Nick Smith. A resident walks through high water on County Rd. 21 near County Rd. 26, Marengo. Photo by Candie Tobin Rogers. The parking lot at the Cardington Dollar General on State Route 42 flooded. A passerby said he saw children playing in the water there at one point. Photo by Carol Bartlett. 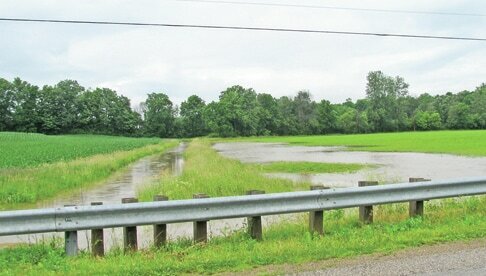 Field flooding and water that crossed the road on Boundary Road. Photo by Carol Bartlett. The heavy rainfall over the past week saturated the ground and left new rainfall no where to go but creeks, roadways and fields. Precipitation is anticipated to continue until Monday and, though Morrow County is not suffering as badly as some Ohio counties, the damage to roads, culverts and fields will be expensive to repair or replace. Pictured are samples of the heavy rain effect around the county. Residents in one home on TR 165 had to evacuate due to flooding.